The most powerful process of marble floor restoration is grinding. This process is also referred as flattening or lippage removal. This step removes roughness and all the ledges, while bringing flatness to marble floors. Grinding also removes the deepest of stains and scratches. Grinding is important to marble floor restoration process because it’s the setup for honing, polishing and sealing. It’s best to have your floors grinned by professionals, at Modern Stone Care we fully understand the grinding process for marble floors and know how to enhance the appearance of your marble floors. Marble floor grinding will smooth the imperfections and opening a new layer which will build a quality hone or add shine finish. The grinding process will remove deep scratches and stains that can appear on the surface. Grinding will also remove the uneven that were installed to your floor. Any floor can have unevenness, this typically occurs during the installation of the floor. Even perfectly installed marble floors can have unevenness. You should have your marble tile grinned once in a few years to reduce the layers of marble stone and decrease the thickness. It’s better to do wet grinding process than dry grinding because dry grinding will produce dust. The technicians at Modern Stone care will use a grinding machine to smooth your floors and use handheld polisher for the hard to reach areas. For high traffic areas of the home like living room, kitchen, lobbies we’ll use diamond abrasive disk for those areas to be grinded. The abrasive disk works as slow-side-to-side motion going over the area at least four times before going forward. After the grinding process is complete, the floors will look dull but that will not last long. 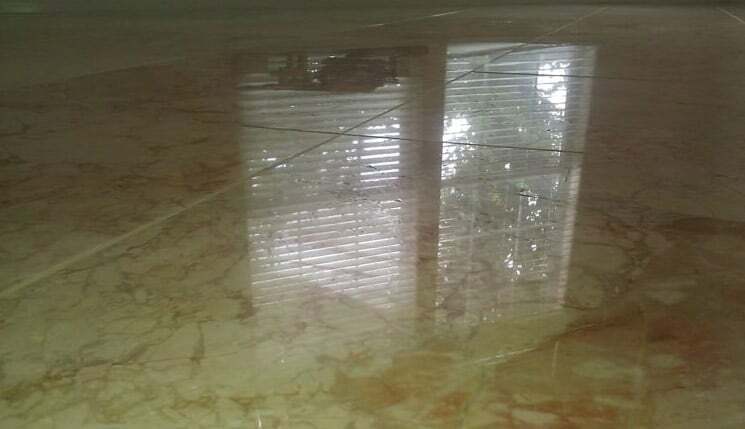 This is when honing and polishing occur to bring the elegant shine back to your marble floors with the finishing touch of sealing to complete marble floor restoration. Learn more about our marble grinding services and see the improvement to your home appearance. Contact the marble flooring technicians at Modern Stone Care today.